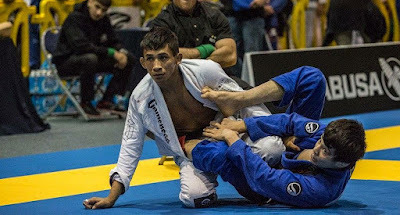 Roosterweight Lucas Pinheiro has joined Andre Galvao’s squad of medal hopefuls just over two weeks out from the IBJJF 2018 World Championships in Long Beach, Ca. Pinheiro, a black belt from Manaus, Brazil, but based in Dallas, Texas, took bronze at 2017 Worlds and is coming off a gold at the recent San Diego Open. Pinheiro is a well-known face on the competition scene and regularly places on the podiums at light-featherweight and roosterweight. For Worlds, Pinheiro will compete at the lowest weight category, rooster, where Atos has not had any representatives until now.